Refuse is unloaded at Recology in San Francisco, Calif., Nov. 2, 2009. Since Jan. 1, when China banned imports of some recyclables, much of what the U.S. recycles has no place to go. Just less than $6 billion worth of U.S. waste was sent to China last year to be converted into packaging and products, and then shipped back to the United States and other markets. Scrap recyclers had taken advantage of low shipping costs for empty containers returning to China after the ships had unloaded their goods on the U.S. West Coast. Today, that flow of trash is just a trickle, the result of a Chinese ban that went into effect Jan. 1 on many types of foreign garbage, from mixed papers to waste textiles. The result of the ban is seen at a recycling facility in Anaheim, California, owned by Republic Services, a national company headquartered in Phoenix, Arizona. 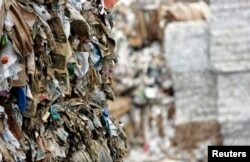 The parking lot of the materials recovery facility (MRF) is brimming with 2,400 bales of mixed paper that once would have been bound for China. The surplus is a result of an unprecedented 12-day backlog, said James Castro, the facility’s general manager. And it’s not clear where it’s all going. 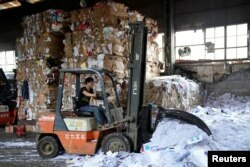 China has banned imports of mixed paper, as well as low-grade plastics, certain metals and other types of waste. In April, it expanded the ban, to go into effect later this year, to include more metals and chemical waste. A ban on additional kinds of scrap, including waste timber, is being targeted for the end of 2019. It has also imposed stricter contamination standards on the scrap it does accept, allowing only 0.5 percent contaminants, down for most materials from 1.5 percent. That has slowed the sorting process, said Richard Coupland, Republic’s vice president of municipal sales. Further complicating matters, the ban has led to a huge reduction in worldwide prices on recyclable goods, such as mixed paper. One year ago, bales of unsorted paper, like those now stacked in the parking lot, would have been worth $100 a ton. Today, each ton is worth “less than $5, or negative in some markets,” including shipping costs, Coupland said. He added that much of the industry’s backlog may end up in landfills. To the north in the city of Azusa, Waste Management’s MRF is also dealing with tightened standards for the workers and sorting machines that use magnets, optical sensors and other means to separate the waste. Executives say they are tweaking a costly system that was designed to meet China’s insatiable craving for scrap. Asia-based journalist Adam Minter, author of the book Junkyard Planet: Travels in the Billion-Dollar Trash Trade, sums up the dilemma facing these companies. He says China’s trash ban is spurred partly by a desire to clean up the environment, but even more by nationalism and a desire for political control. Some environmentalists have welcomed the trash ban. Greenpeace East Asia plastic campaigner Liu Hua said it will send “shockwaves around the world” and force countries to confront their attitudes toward waste, especially environmental contaminants like plastics. China expert Joshua Goldstein of the University of Southern California said the ban will have social repercussions in China. Goldstein said China faces hurdles to create an operation as efficient. Companies are also searching for new markets. More recyclable scrap from the United States will now go to India, Vietnam, Malaysia, Thailand or Indonesia, but industry experts say shipping costs are high and demand in those countries is limited. As commodity prices drop, there is hope for increased use for scrap such as mixed paper in the United States. FILE - Bundled recyclables are seen outside the Pratt Industries corrugated box facility in the borough of Staten Island in New York, July 30, 2008. The facility converts waste paper collected from the streets of New York into 100 percent recycled corrugated boxes. Brent Bell, vice president of recycling operations for Waste Management, said his company is also cleaning up its waste to meet the higher standards that China and other countries are demanding. Republic’s Coupland said the waste and recycling industry needs to work with local communities to find a new business model to replace one that has become unsustainable. It could mean, he said, an increase in the rate that consumers pay for hauling away their trash. China may yet make adjustments to its policies, USC’s Goldstein added. Paper fiber is hard to replace, he notes, and China may loosen its bans to bring in the raw materials that its manufacturers require. “What parts of this reform, this ban, are going to be long term and what parts are going to be short term is still quite unclear,” Goldstein said. But he noted that the economics of the recycling industry are changing.